GEAR4 UnityRemote Saves Your iPhone From Cumbersome Dongles | OhGizmo! I like the idea of using an iPhone or an iPod Touch as a universal remote, but I’m not so crazy about having to stick it in a case, or attach some cumbersome dongle to give it IR functionality. So I really like the solution that GEAR4 has come up with for their UnityRemote. 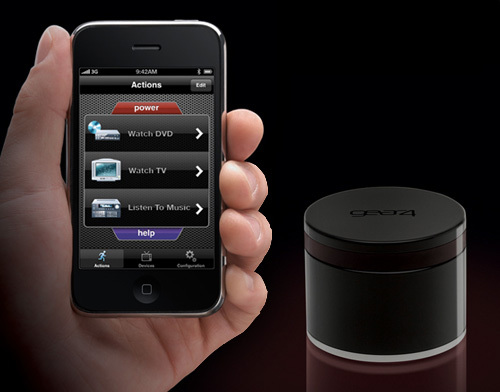 Instead of some accessory you have to attach to your device, a downloadable app talks to a separate Bluetooth controlled receiver that uses 5 infrared emitters to blast out commands in 360 degrees. That way you don’t have to worry about pointing your iPhone or iPod Touch in the right direction either. It’s not going to be available until October according to the GEAR4 website, so there’s not a lot of details available at the moment, but according to The Gadgeteer it will sell for $99. That’s pretty much $90 more than other options like the My TV Remote, so you’ll have to decide if the convenience is worth the extra coin. How to use this GEAR4 .Is it good one ? It is an awesome idea I will hand it to them for that, but like you said the price is pretty high compared to other options out there. Yeah sure convenience is nice but I'd rather spend a lot less. If it came with a lower price tag I would pick one up in a heart beat. Its a very clever solution but a bit pricy.